Time lapse of sunrise at the Iron Mosque. hd00:07Sunrise Time Lapse at Tunku Mizan Zainal Abidin Mosque by a lake in Putrajaya, Malaysia at dramatic and beautiful dawn. Prores 1080p. Zoom out motion timelapse. 4k00:07Sunrise Time Lapse at a Mosque by a lake in Putrajaya, Malaysia. 4KUHD. Zoom Out Motion Timelapse. hd00:08Motion Time lapse of sunrise and clear sky at a mosque in Putrajaya, Malaysia with beautiful reflection in water with golden light. Hyperlapse. hd00:15Nashville, Tennessee - March 25, 2019 : Time Lapse at the Parthenon building in Centennial Park. Reflection in the lake as clouds move across the sky. 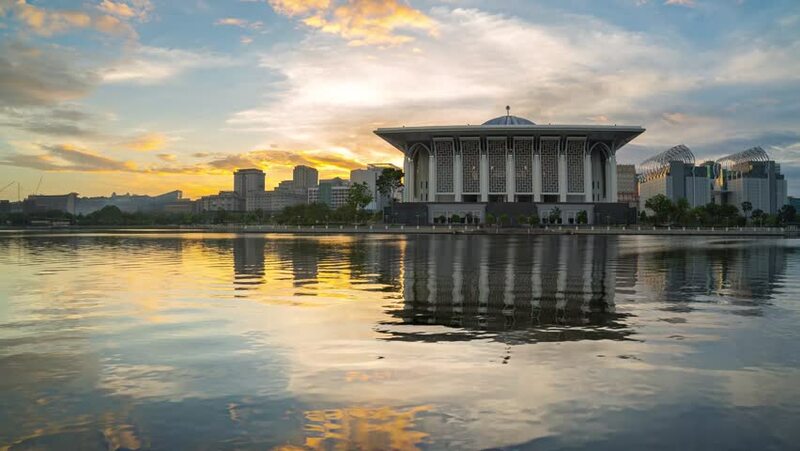 4k00:11Time lapse : 4k Footage of Dancing Cloud and Beautiful Dramatic Sunrise at Iron Mosque (Masjid Sultan Mizan Zainal Abidin), Putrajaya with reflection on the lake water. Pan left motion. hd00:06USA, WASHINGTON - 26 AUG, 2014: Jefferson memorial with a big pond and trees. 4k00:10Majestic sunrise over Masjid Sultan Mizan Zainal Abidin or Iron Mosque with ray of light through the cloud timelapse pan down motion.